Here she is. Gridwork from Christa Quilts brand new book Piece and Quilt with Precuts. Earlier this year Christa opened the blog hop to participants. As you follow the hop you will note that there is a nice mix of quilters, some you may know and some who might be new to you. This mix shows that this book can be used by everyone. When I had the blocks stitched I laid them out first to mix up the colours and secondly to turn them every whichway. A design wall would have been helpful but the design floor worked too. In the photo on the left are all the blocks marching in the same direction. You can see from that photo that not all the blocks are constructed exactly the same. Each design comes fully illustrated including a page with a quilting suggestion. I will admit I was worried I wouldn't be successful with the selected design so reverted to my straight lines with the walking foot design. I stitched on either side of the seams in all directions and then once on the diagonal through everything. The quilt has now been through the wash and is ready to use. Don't have any precuts, don't worry. I did not have a layer cake and a pack of charm squares to make this design. I used a few fat quarters and some scraps and made my own. Putting this quilt together was a lot of fun and I was happy to have an excuse to dive into my black and grey and yellow collection. It looks so great and the straight lines are always a fun favorite to quilt! ...And, thank you for sharing your process! I appreciate seeing how Makers work! I love the colors and the feeling of the design layout your chose. Thanks for sharing. I really like yellow, gray, and black together! Your quilt turned out wonderfully! I love this color combination.....haven't made one yet but I have been collecting fabrics. Like the quilt and the colors. Looks great together! Thanks for sharing. Love your colours. I use my stash as well as don't have many precuts. So glad you could make it work with FQs. I also like your process for putting the design together. Thanks for the hints! I love your quilt!! Thank you!! Love your color choices. And the shot of the finished blocks reminds me of Arizona. They could be adobe houses. Very cool. 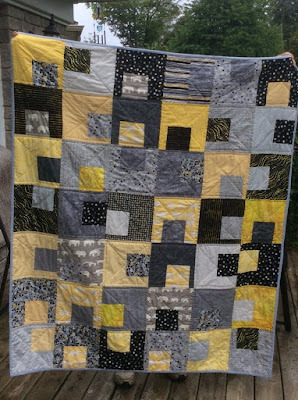 Its been awhile since I have made a grey and yellow quilt. Love yours. Your quilt turned out great. I love your color selection...your quilt turned out great! Thanks for sharing! Great colors! Thank you for sharing your quilt with us. I like grays in quilts. Looks nice. Great color combinations and the elephants are cool! I like your color combo. I really like the way you chose to lay out the blocks. Lots of motion! Thanks for sharing your quilt. Looks great! Love the color combo. I love the combination of colors you selected! Very nice! very nice. I like the yellow and dark colors together. Who would've thought. 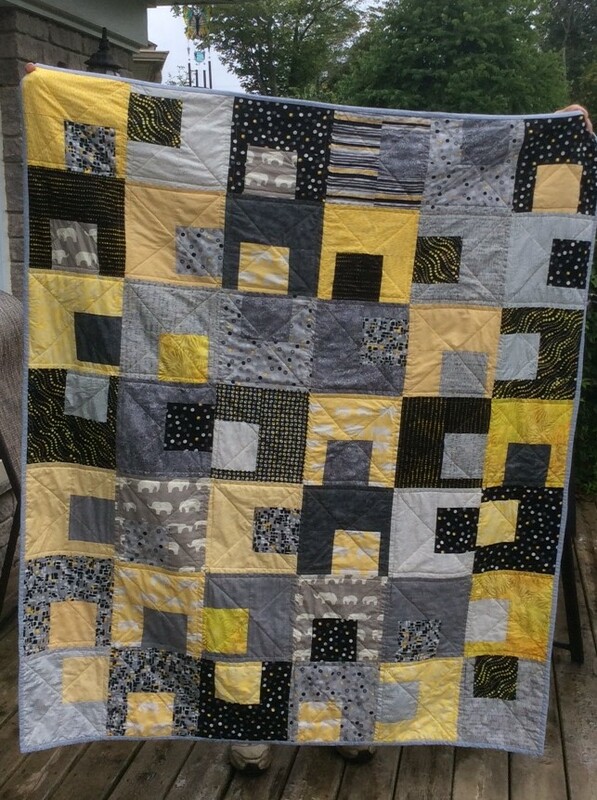 I've always wanted to make a yellow/gray/black quilt. Yours is gorgeous! Love the colors in this quilt! Very nice color choice - adds to the movement of the quilt! My daughter would love this quilt, just her colors. I love the pattern and the colors! I love To see how each persin makes the pattern on their own! Great pattern and I love your color combination. 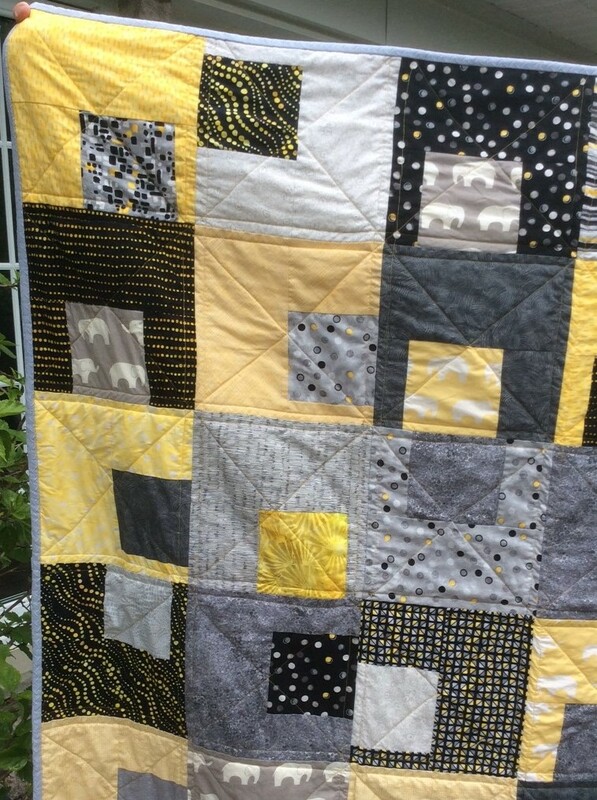 Lovely quilt - I like the use of grey and yellow! Love your quilt and your choice of colors and fabrics! Love your color choices. grey is my new fave neutral. Joanne....my floor works as my design wall too:) I love the layout variation w/the Gridwork blocks. Your diagonal straight lines add just the right angle to the quilt. Yellow and grey are a desired color for a family member of mine...hmm...the black adds some depth that gives appearance of day and night and I love that. I like your final placement of blocks. Very nicely done. Great quilt, Joanne! Love the colors, there's something about black/grey/yellow that draws me. Love this quilt! Beautiful fabrics! I like the blocks in different directions. Great colors! My daughter would love this pattern and the color scheme. I'm looking for a quilt idea and this might just be it. 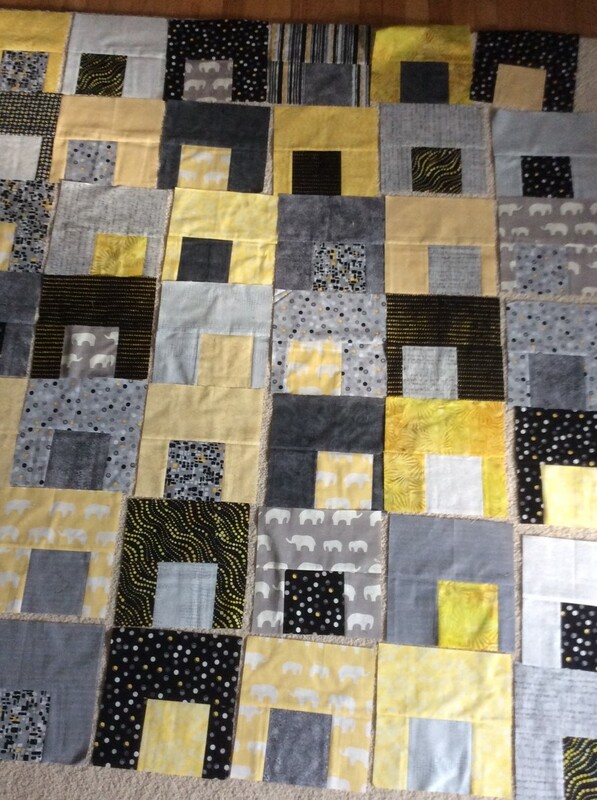 I love the color combo of your Gridworks quilt :) Well done!